Dies R Us: Bring on the Chocolate! With Easter Sunday just days away, I wanted to add one more Easter card for any of you still needing a final card or two. This one is super easy to make & really sweet! 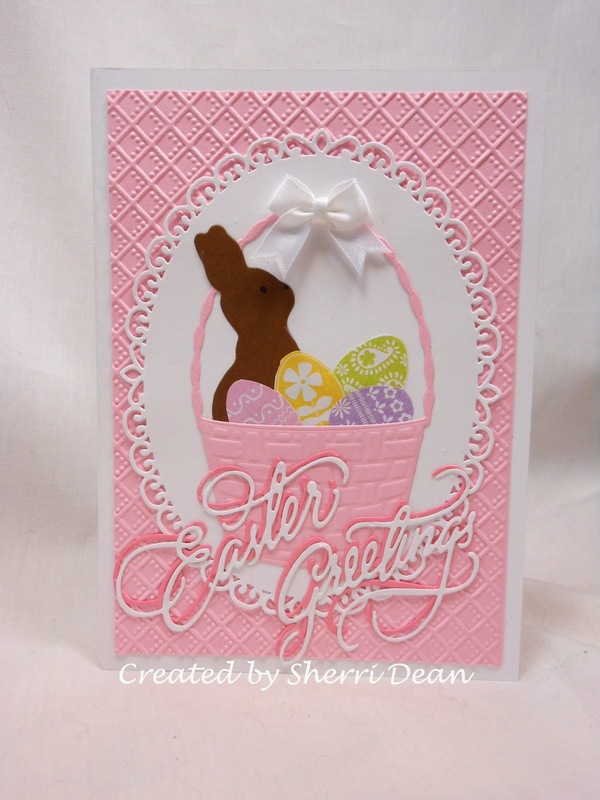 I used the following dies on it: Spellbinders Elegant Ovals, Impression Obsession Chocolate Bunny, Memory Box Bountiful Basket, & Impression Obsession Easter Greetings. I also used the Sizzix Butterfly Lattice Embossing folder, which we carry as well. I LOVE this Memory Box basket! It's perfect for so many cards and creates a beautiful basket embossing when cut. You can fill it with flowers for a totally different look. Like some of you, I have enough paper to stock a small store, so I used some of the Easter paper I had in my stash & simply cut eggs from it. That is a real time saver, especially for a last minute card. To make the beautiful sentiment really pop, I cut it with slightly darker pink and then again in white to create the shadow. Head on over to the store & see what you can find for your next card or scrapbook page! The choices are endless & the prices are the lowest around! Be sure you check out the talented designers who share ideas Monday through Friday every week and use some of those ideas to play along with our Dies R Us Challenge which begins on the first & fifteenth of each month! I'll see you again next week! Have a wonderful and blessed Easter! Thank just looks good enough to eat!